One of the largest, most well known, and frequently visited green spaces in Wrocław is Szczytnicki Park, located east of the Odra River and Plac Grunwaldzki. Throughout the 100 hectares of land, visitors can closely enjoy the approximately 500 species of flora, as the paved paths are lined by various arrangements of shrubs and trees. Other narrower stone paths meander throughout the lush vegetation, while a diversity of unique bridges span the still creeks. 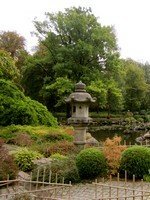 By far, the most special quality of the park is the Japanese Garden, which was originally created for the 1913 World’s Fair. Though most of the features were temporary, the garden wasn’t restored to its full splendor until 1994 with help of the Japanese Embassy. The picturesque and exquisitely planned terrain is filled with Japanese architecture and landscaping elements such as a “floating” rock path over the trickling waterfall. Wooden bridges and pavilions float effortlessly above the pond as their reflection flawlessly captures their cultural majesty. 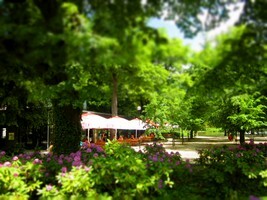 The most prominent characteristic of Szczytnicki Park is Centennial Hall and its adjacent fountains. Completed the same year as the Japanese Garden, the coliseum dome is built of reinforced concrete using similar techniques to the Pantheon in Rome. The landmark glistens like a full pot of gold in the afternoon sun, and was established as a UNESCO World Heritage Site in 2006. 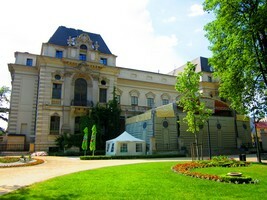 The exhibition ground, located in front of this modernist structure, contains the Wrocław Fountain, which is surrounded by an ivy-covered pergola. The one-hectare fountain comes to life through animated daily performances coordinating lights with music. The show is available for viewing from May until the end of October from 10:00-22:00. The dazzling water show lasts from three and half to eighteen minutes including both classical and modern music. Friday and Saturday evenings offer the most spectacular shows with a large audience. During the winter months, the fountain is transformed into an ice skating rink. The park also contains the St. John of Nepomuk Church, which was built completely of wood at the beginning of the 17th Century. 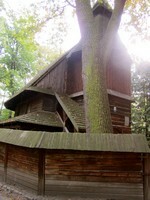 In 1913, the church was moved from Kędzierzyn Koźle to a wooded alcove of the park and presently contains a bookstore and gallery. In stark contrast to the antiquated church is a tapering steel-spire monument that stands almost 100 meters tall. Built in 1948 to commemorate control over the “Regained Territories” after WWII, the spire remains a valuable architectural symbol of Wrocław. Its English natural style, abundance of flora and fauna, and admired attractions make Szczytnicki Park a delightful destination, regardless of the time of year. Located adjacent to the grand, neo-baroque Puppet Theater, Wrocław’s Ogrod Staromiejska, literally “Garden Old Town”, is an absolute must see destination. Situated on approximately two acres, this pre-war urban park is extremely well maintained and manicured; it looks like it could be the scene for a movie. 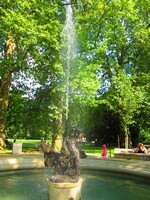 The park’s centerpiece is a statue of a swan and a little boy, which crowns a large circular fountain, and is surrounded by an elegant seating area. Attached to the Puppet Theater is an expansive terrace and outdoor stage for summer concerts, exhibitions, and other cultural events. A black metal aviary stands in the east side of the garden, usually home to exotic species of birds during the warmer months. 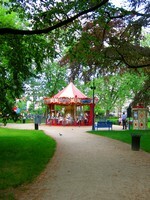 Following the winding paths to the north edge of the park, one will come across a gorgeous 19th Century French carousel. 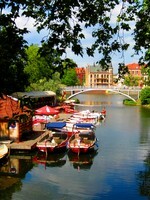 The yellow and red canopy crowns a molding filled with vintage paintings of Wrocław. The highlight of the park for younger visitors is the newly built and gated rubber-lined play area with all sorts of trendy toys. A beautifully ornate wrought iron fence surrounds the property, and though the park is gated and closed during the night, there are no fees to enter. Not only is the park extremely clean, but a full service security staff also keeps it safe during all hours of operation. This gorgeous park is the perfect blend of historical, vibrant, and modern cultural features that makes it a picture-perfect enclave for the young and old at heart. 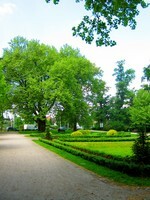 Park Południowy, which translates to South Park, is located in the southern part of the city, as the name suggests. 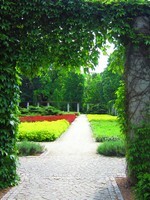 Founded in 1877 by Julus Shottlander, a wealthy Jewish merchant, the park was a gift to the local community. It could easily be dubbed Wrocław’s “Central Park” as it provides an escape from the hustle and bustle of everyday city life. Upon entering the park from the southwest, guests are greeted by an alcove of ivy-covered columns, which surround a bronze statue of Chopin that rests on a pedestal of stone steps. The statue commemorates the pianist and his visit to Wrocław in 1830. Meander away from the monument, through the rows of benches, and you will find yourself at the water’s edge of the expansive pond. Surrounded by marshy vegetation, the lake is a popular destination for feeding the friendly ducks and enjoying the white noise of the bubbling fountains. The outdoor café, “Agawe”, offers beautiful views of the breathtaking gardens and expansive lake. There is even an unofficial, designated area on the far side of the lake for sunbathing. Patterned stone walkways and dirt trails create an extensive network of winding paths throughout the approximately 22.5 hectare park. When one comes to a cross point, it’s difficult to decide which way to go next, as each path provides for incredible and delectable scenery. Clusters of lavender rhododendrons serve as centerpieces for the exquisitely landscaped paths. The towering trees provide large areas of shade and the richness of the sap seeps into the pollen filled air. Plenty of wooden benches provide the perfect destination to rest, people watch, and take in the majesty of the surroundings. Some of the most magnificently singing birds spend their days showcasing their skills to the park’s visitors. For the most scenic views of the park’s happenings, be sure to visit the ornate iron bridge that spans the creek, or check out the pond’s observation platform lined by a decorative stone column railing. Children can play as much as their little heart’s desire in the fenced-in area filled with jungle gyms, swings, slides, and toys; or they can run free in the enormous grass fields. It’s also very commonplace to see a slew of young mothers pushing strollers and corralling toddlers around. For a more rigorous hike, trek up the park’s large hill to reach a beautiful gazebo that soars towards the sky from the railway embankment. Each area of this park offers many uses whether it’s a gentle stroll through the tree-lined paths, an afternoon of reading and relaxing on a bench, or an open field for sports and recreation. The landscape architecture of Park Południowy proves to be timeless as this Wrocław gem will always be a valued community gift. Old Town Promenade, known locally as Promenada Staromiejska, is a tree-lined walkway surrounding Wrocław’s old town moat. The greenbelt was created during the early 19th Century after the city’s fortification walls were destroyed. 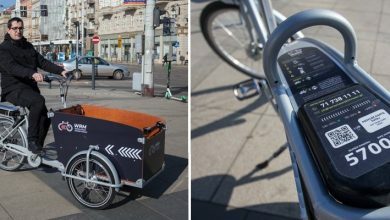 Each part of the walking avenue is full of character, but the most important aspect of the promenade is how it threads a myriad number of Wrocław’s historical and cultural destinations together. For instance, the park connects the former defense structures, Ceglarski Bastion and Hill Partisan, which offer unrivaled views of the Odra River and Cathedral Island, as well as the Old Town District, respectively. However, it is important to note that the restoration of Ceglarski Bastion will not be complete until June 2012 and Hill Partisan is still in desperate need of a renovation. Rising above Most Skargi, is a stunning white and yellow crescent-shaped outdoor arcade, which dates from a 19th Century redevelopment and was created for public recreational use. Interestingly enough, during World War II, the underground bunkers of Hill Partisan were used as hidden Nazi Headquarters. After the war, the catacombs accommodated a museum, and a couple decades later, it housed a few bars. Today, unfortunately, some of the area along this part of the promenade is neglected without care, littered with bottles, and spoiled by nonsensical graffiti. Old Town Promenade has made it on the list of registered monuments of Wrocław, further emphasizing its importance as a connector route for local attractions. 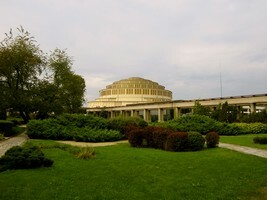 While visiting the park you can easily access John Paul II Square, The Academy of Music, The Puppet Theater and Opera, The Museum of Architecture, The Academy of Fine Arts, The Racławice Panorama, and The National Museum. Near Galeria Dominikanska is Oławska Gateway, which is no normal subterranean pedestrian passage. A relic of the 13th Century gateway to the city, it contains the original fortification walls, a cannon, and a miniature model of the Oławska gates and towers. While meandering throughout the trails of this extensive park, it is interesting to consider how well the paths blend into the surrounding environment whether adjacent to a modern mall, a historical theater, a lively road, or a calm river tributary. 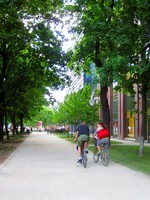 Daily activities here include walking, running, biking, meeting, socializing, picnicking, and fishing, among others. Towards the northeast part of the promenade, as it merges into Park Słowackiego, the boulevards become lined with up to three, or even four, rows of large trees, while statues and memorials of all different types scattered about commemorate the city’s vibrant past. While the expansive park finds its strength in joining numerous destinations, its lack of events, the odd dirty spot, and crumbling structures cannot be overlooked. As one of the most visited pedestrian trails and parks in the city, Promenada Staromiejska is nonetheless rife with cultural, architectural, and historical heritage. 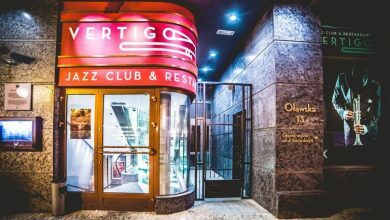 Uncut would like to say thanks to Lauren Petersen for her fantastic contributions, and to Marta Dyner for helping to select the locations in this review. 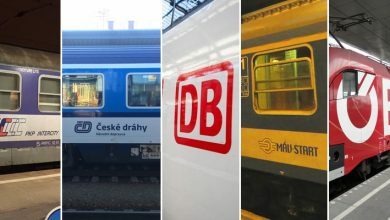 An Indiana girl at heart and a former miss Indianapolis, Lauren Petersen wrote a number of intriguing and insightful articles for Wroclaw Uncut during her time in Poland as Fullbright scholar.